During molt, males lose most of their striking colors, and males and females can only be distinguished by subtle differences in coloration and plumage patterns. The colorful appearance of the male harlequin is reflected in both its common and its scientific name (histrionicus histrionicus) that refers to the brightly colored feathers. The slate blue-gray feathers with distinct black, white, and rufous markings on the head, neck, back, and sides is reminiscent of the gaily colored dress of medieval court jesters or "harlequins." The Latin, Histrio, means "stage player." With their color, males blend well into their multicolored and textured backdrop of various algae, mussels, rocks, and frothy waves. Females are less conspicuous. White facial patches on an otherwise chestnut brown body identify the more cryptic females. Males are larger than females, averaging about 650g (1.5 lbs) to females 575g (1.3 lbs). This is about half the size of the more familiar mallard. Females most closely resemble female surf scoters or buffleheads. The much larger female scoters are easily differentiated from harlequins by the much larger bill. Bufflehead females have a singular white face patch and a white wing patch. As with most sea ducks, harlequins do not mature or attain full adult plumage until they are two years old. Young males may be confused for females in their first winter if the subtle differences in plumage are not closely observed. The year in the life of a harlequin duck can be divided into three primary events: wintering, breeding, and molting. Paired birds usually depart for breeding streams in late-April or May, but timing varies considerably according to diverse ecological conditions across their broad wintering and breeding range. The widespread harlequin is known to also breed along glacial lakes, in tundra ponds, and perhaps rarely on offshore islets in marine waters. Many non-breeding birds remain on the coast year-round. Prior to nesting, pairs will make flights up and down streams to prospect for nest sites. Most nests are built close to water, on the ground in dense vegetation, among tree roots, or in rock crevices. Nesting females take full advantage of their unobtrusive coloration and habitat to avoid detection, and their presence is not often discovered. She must find a spot where she will hopefully be well concealed from mink, bears, eagles, land otters and any other predator while safely above the flood stage of the river. Nests are generally initiated between mid-May and mid-June. Eggs are laid every one to three days. After five to seven pale buff colored eggs are laid incubation begins. The female incubates her eggs for about 28 days. Upon hatching, the female will lead the precocial young to the nearby stream within 24 hours. It will be another 42 to 56 days before the young can fly. Fledging generally begins around mid-August and may continue into September. Like many other ducks, male harlequins have no role in incubating eggs or rearing young. Soon after females begin incubating, males return to the coast to join non-breeding birds and molt their feathers. Molt sites are often close to their wintering sites. Studies in Iceland have indicated that food availability on the mountain streams may limit the density of nesting birds, so departure of males may improve survival of females and their young. In general, males return to the coast in mid-to-late June and are molting by early July. Each year waterfowl lose all their flight feathers and until new ones emerge they cannot fly for three to four weeks. During molt, males lose most of their striking colors, and males and females can only be distinguished by subtle differences in coloration and plumage patterns. Most females, depending upon their success in hatching and rearing young, will not return to the ocean for another one to three months. Nesting females with their young are the last to return, arriving at coastal molting sites in August and September. Females rejoin males at molting sites and pair bonds are usually rejuvenated in fall or early winter. Marking and recapture of molting birds in successive years indicates that these sites are used by many of the same ducks year after year. Following the molt and throughout winter many birds remain along the same few-kilometer stretch of shoreline. Birds remain along the coast until the following spring. As with other sea ducks, harlequins are skilled divers that feed primarily on a variety of intertidal benthic invertebrates. Snails, periwinkles, small clams, limpets, chitons, blue mussels, hermit crabs and amphipods are some of the more sought after species. In late summer and early fall, once salmon spawn, harlequins commonly feed at creek mouths where their diet includes alevins and salmon eggs. In March and April harlequins may find a rich food source in herring spawn when it becomes seasonally available. On nesting streams, harlequins feed either by skimming organisms from the surface or by diving. Harlequins are better able than other ducks to contend with strong currents, spending a greater proportion of their foraging time under water among current-swept rocks and boulders. Larvae of aquatic insects are the main prey species in summer; especially those associated with the highly oxygenated waters of rushing mountain streams, such as midges, blackflies, caddisflies, and stoneflies. Like most waterfowl, harlequins migrate to a separate breeding area. After spending at least eight months at a coastal wintering area, the advent of spring triggers nesting behavior and this requires a new environment. The migration can be a short "lateral" one, simply flying up a nearby coastal breeding stream, or the trip may be lengthy and protracted. Birds wintering along the British Columbia coast migrate east or northeast and nest in the coast range and Rocky Mountains of the U.S. and Canada. 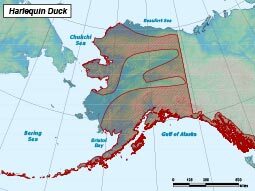 There is little information on the links between wintering and breeding areas for most of Alaska's harlequin ducks. A male from Prince William Sound, marked by ADF&G, migrated over 2,000 km to a breeding stream in the Anadyr River drainage of Russia while others migrated to breeding areas in the Brooks Range and Kenai Mountains. Meanwhile other birds from Prince William Sound nest on coastal streams a short distance from their wintering areas. Birds wintering in the western Aleutian Islands may nest in Russia or Alaska while many of those in southeast Alaska may nest in Canada. Birds wintering in Asia nest in the mountains of eastern Siberia. 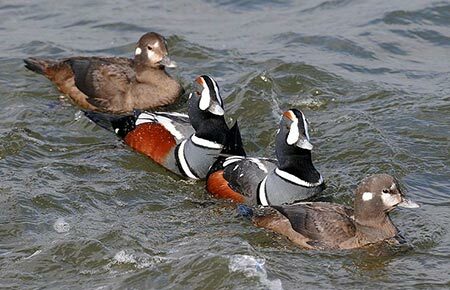 Worldwide, harlequin ducks are divided into two distinct populations — a larger western or Pacific population and a much smaller eastern or Atlantic population. Genetic markers identify these as two distinct, geographically isolated populations. Alaska's birds are part of the Pacific population which includes birds wintering in nearshore waters of western North America and eastern Asia. The wintering range in western North America extends from the Pribilof Islands (southern Bering Sea) and Aleutian Islands of western Alaska as far south as northern California. The Pacific population is most numerous in Alaska and British Columbia where it may exceed 250,000 birds but no comprehensive population estimates have been conducted. Large concentrations occur in the northern Gulf of Alaska including the Aleutian Islands and Alaska Peninsula, Kodiak Archipelago, Kachemak Bay, Prince William Sound, the Alexander Archipelago in southeast Alaska and British Columbia. Asian birds winter in Russia, Japan, and Korea in scattered locations from the east coast of Siberia south to the Sea of Japan. Harlequin ducks breed in fast-flowing streams scattered throughout coastal and interior mountains. The Pacific harlequin duck breeds from northeast Siberia across to arctic Canada, throughout most of Alaska and British Columbia, and in the coastal and inland mountains of Oregon and Washington and the northern Rocky Mountain regions of the U.S. and Canada as far south as Wyoming. Historically, birds bred as far south as central California. In Alaska breeding records include the eastern North Slope, Northwest Alaska, St. Lawrence Island, Yukon-Kuskokwim region, Alaska Peninsula, Denali National Park, northern coast of the Gulf of Alaska, and Southeast Alaska. Much of their habitat remains pristine and they are numerous in Alaska throughout the year. Harlequins are affected by degradation of water quantity and quality, human development near breeding streams, and intense recreational activity. They are particularly vulnerable to oil spills because spilled oil is often deposited in their intertidal habitats. The Exxon Valdez oil spill (EVOS) occurred in March before harlequins migrated to breeding areas. An estimated 1,298 to 2,650 harlequin ducks were killed within the area affected by the spill. The effects of the oil spill went beyond the immediate and direct mortality as intertidal habitat remained oiled and birds likely ingested sub-lethal doses while preening oil from feathers or from eating oil-contaminated prey. This was aggravated by clean-up activities which continued for several years and in some instances killed benthic invertebrates and the influx of boats, machines, and workers likely displaced birds from some of their preferred habitats. Seventeen years after the spill, birds are still being exposed to lingering oil. Wintering range extends from the Pribilof Islands (southern Bering Sea) and Aleutian Islands of western Alaska as far south as northern California. Breeding ranges occur throughout much of the state including the eastern North Slope, northwest Alaska, St. Lawrence Island, Yukon-Kuskokwim region, Alaska Peninsula, Denali National Park, northern coast of the Gulf of Alaska, and southeast Alaska. Intertidal benthic invertebrates including snails, periwinkles, small clams, limpets, chitons, blue mussels, hermit crabs and amphipods. In the summer diets include alevins and salmon eggs. Bald eagles, jaegers, ravens, and river otters on adults, and mink, martens, foxes, and wolves on nests.